Stay awake & listen to the masayab (tragedies) of Imam Hussain(as) ,his family & his companions. When you finish the fourth unit, you may remember Almighty Allah swt, invoke blessings upon the Holy Prophet and his Household, and curse their enemies as many times as possible. All glory be to Allah,all praise be to Allah,there is no god save Allah,Allah is the Greatest,and there is neither might nor power save with Allah, the All-high the All-great. Focus on the great tragedy that took place on this day and avoid attending to your business/employment matters, laughing and unnecessary discussions. Recite Salawát as many times possible. May Alláh make our reward and your reward great, for our grief for Hussain, peace be on him. May He place us and you from those who help his cause with His representative, the guided Imám from the family of Muhammad, peace be on them. Recite Sura al-Ikhlás 1000 times, or as many times as possible. 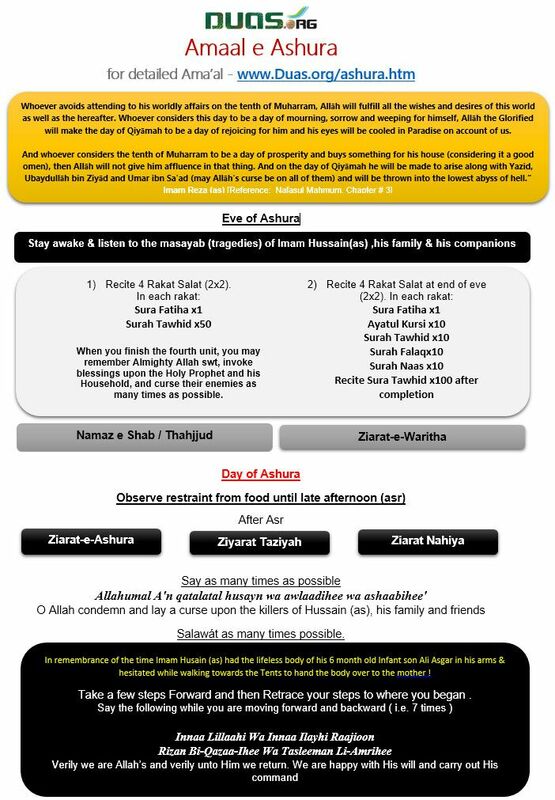 Recite the following Salaat, dua’as and Ziyaarat, after Fajr Salaat, but before Zuhr Salaat. 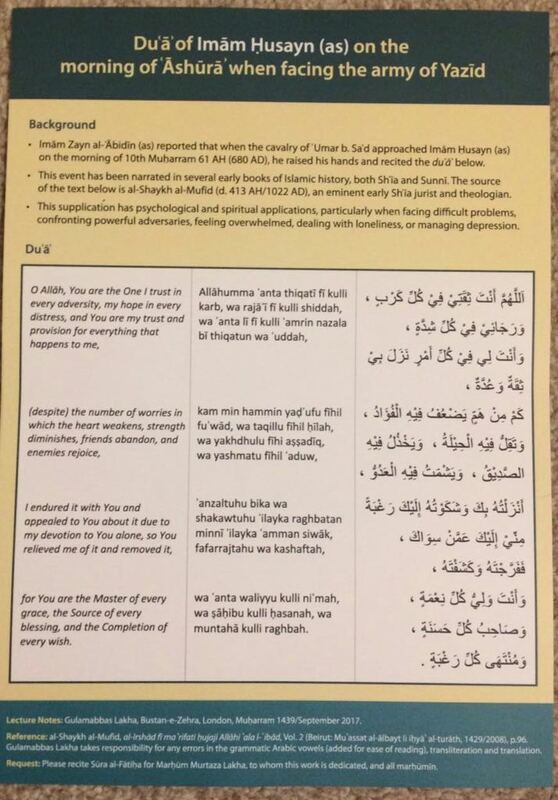 a) First prayer: In the first raka`a, after Súra al- Hamd, recite Súra109 al-Káfirún In the second raka`a, after Súra al-Hamd, recite Súra al-Ikhlás. In remembrance of the time Imam Husain (as) had the bloodied body of his 6 month old Infant son Ali Asgar in his arms & hesitated while walking towards the Tents to hand the body over to the mother ! a )Take a few steps Forward and then Retrace your steps to where you began . O Allah! Condemn and punish the licentious profligates who make the life of Thy Messenger miserable; and waged was against Thy close friends, and worshipped others, (but ) not Thee, deemed lawful (that which) Thou had forbidden, bring a curse upon their leaders, followers, on those who were in them, secretly or distinctly were hand in glove with them, or condoning their (mis) deeds. A great many curses. O my Allah, bid to bring joy and happiness quickly for “Aali Muhammad”, (the children of Muhammad), bestow Thy blessings on him and on them, save them from the dangerous clutches of the undercover two-timers, and the obstinate disbelievers; open for them the doors of “the beginning”, a facility to put in practice gentleness, kindness and fairplay; create favorable conditions for them to make life full of love and thought, cheerful, free of care, as early as possible, on Thy authority let them have full control over Thy enemies, to help, rescue and defend (mankind). اَللّٰهُمَّ وَ عَجِّلْ فَرَجَ اٰلِ مُحَمَّدٍ وَاجْعَلْ صَلَوَاتِكَ عَلَيْهِ وَ عَلَيْهِمْ وَاسْتَـنْقِذْهُمْ مِنْ اَيْدِى الْـمُنَافِقِيْنَ الْـمُضِلِّيْنَ وَ الْكَفَرَةِ الْـجَاحِدِيْنَ وَافْتَحْ لَـهُمْ فَتْحًا يَّسِيْرًا وَ اَتِحْ لَـهُمْ رَوْحًا وَ فَرَجًا قَرِيْبًا وَاجْعَلْ لَهُمْ مِنْ لَّدُنْكَ عَلٰى عَدُوِّكَ وَ عَدُوِّهِمْ سُلْطٰنًا نَّصِيْرًا. O my Allah! Indeed a great many among the people declared war, laid traps and intrigued against the careful and gentle guardians who observed and fulfilled the duty. O my Allah, upset and overturn the plan and movement of Thy enemies, (who are also) the enemies of Thy Messenger and the children of Thy Messenger. O my Allah, put a stop to the spread of their sphere of influence; make their equipment and men unserviceable, their expression confused and contradictory; break up their support; crack up their strategy; lay hold upon them, hit and cut off by Thy one sharp strike; throw them down, frightened by Thy hard unnerving barrier, bury them under the swallowing mud of disasters; let them be mean and contemptible under the yoke of despise-able penance; bring them to book and let them have the taste of a hard and sharp retribution; fester them with definite and exemplary punishment, as Thou wipes out Thy enemies; it is beyond the shadow of doubt that Thou cracks down upon the criminals. O my Allah, the way of life approved by Thee has been tossed aside; Thy code of law has been suspended; and the descendents of the Prophet, in this world, had been tormented. O my Allah, Therefore give all Thy attention and care to signify truth, and the upholders of truth; restrain and prevent falsehood, and the camp-followers of false-hood, and take us to safety as a favour; guide us to true faith; make available for us, as soon as possible, happiness and bliss, bring everything in to good order through the inspiring presence of Thy representatives; make us desire and love them , make them receive us with open arms. O my Allah, send blessings, in the beginning and at the end, on Muhammad and on the children of Muhammad; keep at peace at all times, Muhammad and the children of Muhammad, let Thy love and tenderness always envelop Muhammad and the children of Muhammad, more thoroughly and decisively than Thou had blessed, kept at peace and loved Thy Prophets, Messengers, Angels and the bearers of Thy Arsh, in the name of and for the sake of “LAA ILAAHA ILLAA ANTA”. اَللّٰهُمَّ لاَ تُفَرِّقْ بَيْنِىْ وَ بَيْنَ مُحَمَّدٍ وَّ اٰلِ مُحَمَّدٍ صَلَوَاتُكَ عَلَيْهِ وَ عَلَيْهِمْ وَاجْعَلْنِىْ يَا مَوْلاَىَ مِنْ شِيْعَةِ مُحَمَّدٍ وَّعَلِىٍّ وَّ فَاطِمَةَ وَ الْحَسَنِ وَ الْحُسَيْنِ وَ ذُرِّيَّتِهِمِ الطَّاهِرَةِ الْـمُنْتَجَبَةِ وَهَبْ لِىَ التَّمَسُّكَ بِـحَبْلِهِمْ وَ الرِّضَا بِسَبِيْلِهِمْ وَ الْاَخْذَ بِطَرِيْقَتِهِمْ اِنَّكَ جَوَادٌ كَرِيْمٌ. O He who decrees that which He wills, does that which He wants. It is Thou who possesses and exercises absolute power; therefore (all) praise is for Thee (only); (Thou alone art) the praiseworthy, the thankworthy. O my Master, let them have a life full of love and peace, and let us share the harmony and bliss with them, because Thou has given a guarantee to put them on the highest pedestal of love, honour and wisdom, after the severest trial and tribulation, to do too much for them , exceeding all bounds, after they had put up with the worldly minimum (in Thy cause), to make them distinct and evident after (Thy enemies) kept them in obscurity, O the Most Truthful ! O the Most Merciful! فَاَسْئَلُكَ يَا اِلٰـهِىْ وَ سَيِّدِىْ مُتَضَرِّعًا اِلَيْكَ بِـجُوْدِكَ وَ كَرَمِكَ بَسْطَ اَمَلِىْ وَ تَـجَاوُزَ عَنِّىْ وَ قَبُوْلَ قَلِيْلِ عَمَلِىْ وَ كَثِيْرِهٖ وَ الزِّيَادَةَ فِىْ اَيَّامِىْ وَ تَبْلِيْغِىْ ذٰلِكَ الْـمَشْهَدَ وَ اَنْ تَـجْعَلَنِىْ مِـمَّنْ يُدْعٰى فَيُجِيْبُ اِلٰى طَاعَتِهِمْ وَ مُوَالاَتِـهِمْ وَ نَصْرِهِمْ وَ تُرِيَنِىْ ذٰلِكَ قَرِيْبًا سَرِيْعًا فِىْ عَافِيَةٍ اِنَّكَ عَلٰى كُلِّ شَىْءٍ قَدِيْرٌ. in Thee do I seek refuge that I should be among those who hope not for Thy “Days”, so make me full well and be there, O my Master, through Thy mercy, in that time. Imām Alī ibn Mūsā al-Rezā (a.s.) said:“Whoever avoids attending to his worldly affairs on the tenth of Muharram, Allāh will fulfill all the wishes and desires of this world as well as the hereafter. 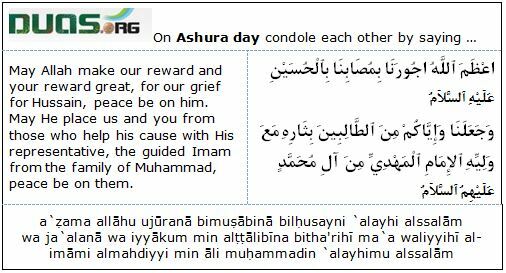 Whoever considers this day to be a day of mourning, sorrow and weeping for himself, Allāh the Glorified will make the day of Qiyāmah to be a day of rejoicing for him and his eyes will be cooled in Paradise on account of us. Du`¡' al-°usayn , which is the last prayer he said when his enemies surrounded him in large numbers on the Dayªsh£r¡ (the tenth of Mu¦arram): Ibn `Ayy¡sh has reported al-°usayn ibn `Al¢ ibn Sufy¡n al-Baz£f¢ as saying that he heard Imam Ja`far al-¯¡diq (`as) saying this prayer on the third of Sha`b¡n, the birthday of Imam al-°usayn (`as). and the Rememberer of those who mention You. and I depend upon You for I trust in none save You. out of Your mercy, O most Merciful of all those who show mercy!